Look at the balance in your bank account at least once a week and reconcile the invoices you’ve issued or paid with the cash-in and cash-out transactions that have gone through the bank account. Sounds like a simple job, but if it isn’t done regularly, it makes it almost impossible to monitor your cash position. Check if there are any overdue invoices – do you owe suppliers or are there outstanding client invoices? If you’ve reconciled your payments, you can quickly identify what’s still due. Are there any large payments to be made? For example, VAT or quarterly rent? If you can see the cash balance in your bank account is going to go into the red, it gives you a chance to take action before it happens. If you find it difficult to balance your cashflow, one solution is to use an overdraft as a cushion. But there are better options. First, look at what you’re owed – can you ask for early payment from your clients? You could try negotiating. Clients may be in favour of paying you early if you offer them a discount. Another option is to get an advance against outstanding client invoices to cover your working capital requirements in the short term. This is called Invoice Finance and you can read more about it in our guide. Alternatively, you could look at your suppliers’ bills. Could you negotiate to defer payment? Treat this as a one off, not a regular option, as it could affect your terms of business with them. Whichever way you look at it, though, the best solution is to properly manage cashflow day-by-day. Want to find out more? 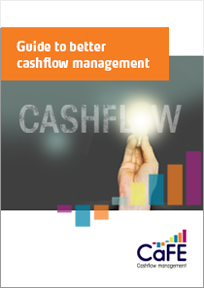 Then download our guide to Managing Cashflow – it’s packed with practical advice and is completely free of charge.